Here at Chiro-Med Health & Wellness in Crestwood, we believe that given the proper nutrition, your body has the amazing capability of keeping itself healthy. We also believe that nutrition should be individualized to meet each patient’s needs. 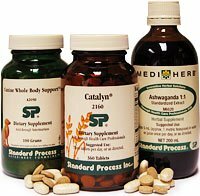 For these reasons and many more, we proudly recommend Standard Process Whole Food Supplements. MOXXOR is a powerful anti-inflammatory and antioxidant supplement formulated from New Zealand’s greenlip mussel and Sauvignon Blanc grape seed extract. MOXXOR is the earth’s preeminent source of Omega-3, which has known anti-inflammatory properties and is up to 480 times more effective than other Omega-3 oils on the market. MOXXOR derives its powerful antioxidant properties from grape seed extract, which have known antioxidant levels that are up to 3 times more effective than Acai and Mangosteen, and up to 50 times more effective than Goji, as measured on the ORAC scale. Metagenics, a privately held company, was founded in 1983 with the mission to help patients achieve their genetic potential through targeted nutrition. They are a leading developer and manufacturer of natural, science-based nutriceuticals. Metagenics’ nutrigenomics research center is dedicated to researching and evaluating the effects of natural ingredients on genetic expression and protein activity. If you have any questions regarding any of our nutritional products or how they can help improve your health, please don’t hesitate to ask us.